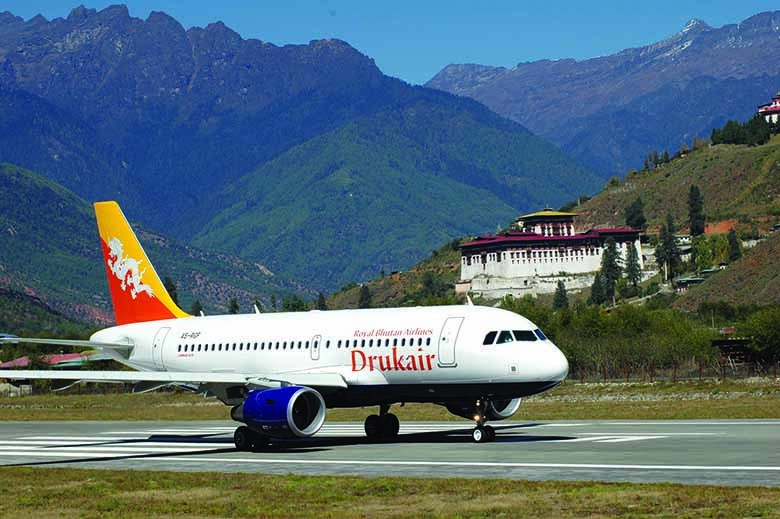 This cultural-tour can be juxtaposed to Bhutan’s most challenging trekking route, the Snow Man Trek in the high Himalayas, as it traverses for 16 days from Western Bhutan to the East, offering you glimpses of the historical and cultural bastions of the Kingdom Providing a very comprehensive picture of the Kingdom, it will take you intro the different regions of Bhutan, diverse in ethnicity, way of life and dialects. Another catch of this trip is the immeasurable natural beauty and a plethora of flora and fauna along the way. On the arrival you will be greeted by the representative of Atlas Tour and Travel. 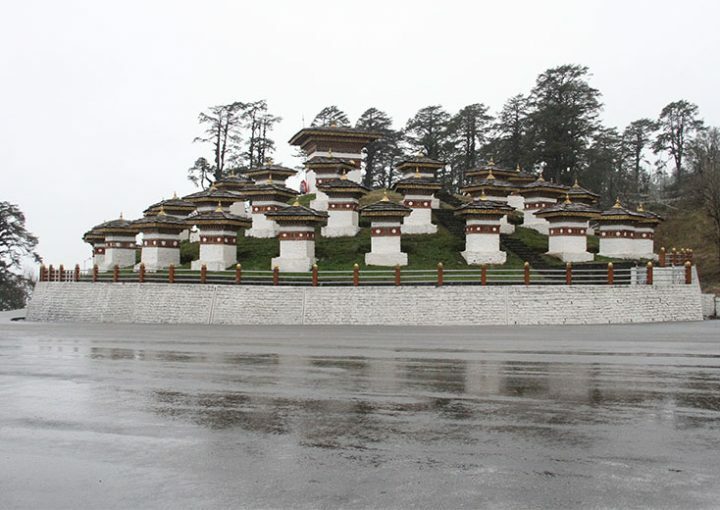 Drive to the SamdrupJongkhar, South-eastern part of Bhutan bordering the Indian states of Assam and Arunachal Pradesh. Overnight in hotel. After breakfast drive to Tashigang, passing through several villages. En-route visit hand loom (weaving center) in Khaling and then visit blind School. Continue drive to Tashigang, Vividly colored handloom cloth and end silk spun from cocoons bred from castor oils plants are local specialties. Sakteng, who are known for their exceptional features and for their costume made of Sheep skin and Yak wool. The hat they wear is unusual but has a significance of its own. We might be able to meet a few of these people. 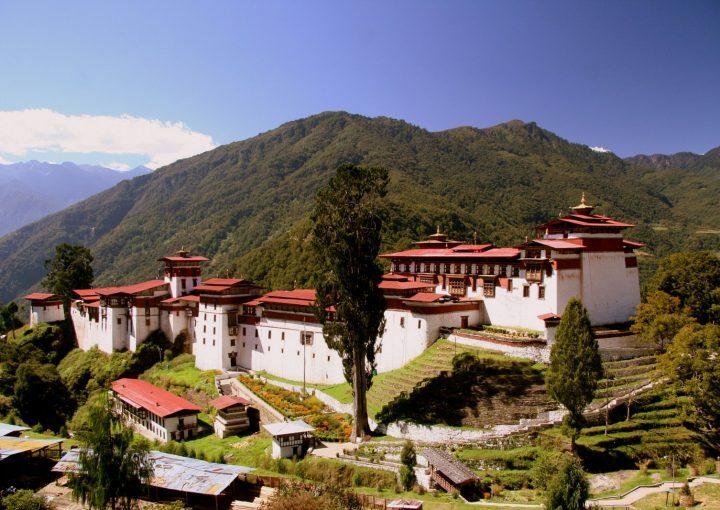 Visit Trashigang Dzong which stands on the hill slope below the main street. The Dzong built in the mid-17th century, serves as the administrative seat for the district, as well as school f Trashigang Dzong or the monk. Overnight at hotel. After breakfast drive up to Jigmeling approximately 3 and half hour. The hike up to Merak village takes 1 hour. Lunch at Merak . In the afternoon visit Merak village and mingle with the locals. Evening dine with the people of Merak followed by native dances of Merak and Sakteng – Achulamoa Cham and folk dances which is worth witnessing. Overnight at local guest house. On the way back visit Phongme village and drive to Radhi for lunch. After lunch drive to Rangjung and visit Rangjung Woesel Chholing Monastery-this was founded by Garab Rinpochhe in 1990. Evening stroll around Rangjung town. Overnight at hotel. back to Tashigang. Overnight at hotel. After breakfast drive to Mongar. En route stop to visit Drametse monastery- founded by Ani Choten Zangmo, Pema Lingpa’s granddaughter, who fled from Bumthang to escape a proposal of marriage from the local king. She fled east and when she found a place ideally suited for meditation and practice she named it ‘Drametse’ which literally means ‘the peak where there are no enemies’. Ani ChoetenZangmo’s kudung (remains) is preserved to this day in the monastery as the most important relic. Continue drive to Monger. After lunch visit Mongardzong which is built in keeping with traditional by not using any drawings or nails and then visit yaggangLhakhang . Overnight at hotel. 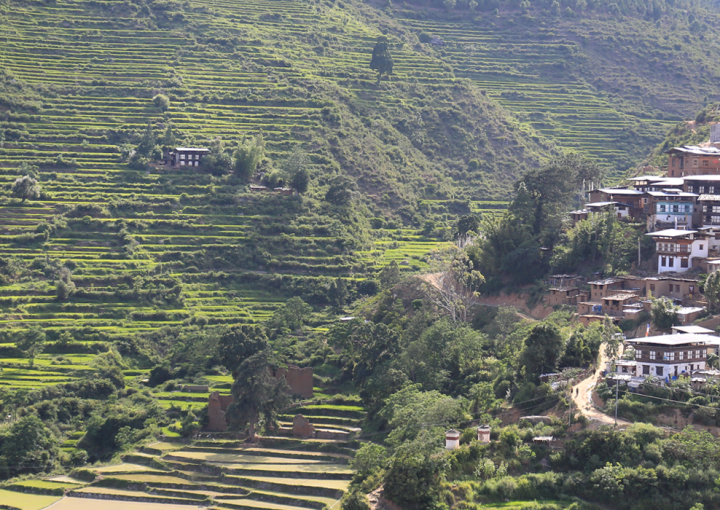 reaching Bumthang we can go to the small town and mingle with the locals there. Overnight in hotel. -Jambay Lhakhang: Is a sacred monastery built in the 7th century by the Tibetan king, Songtsen-Gampo. 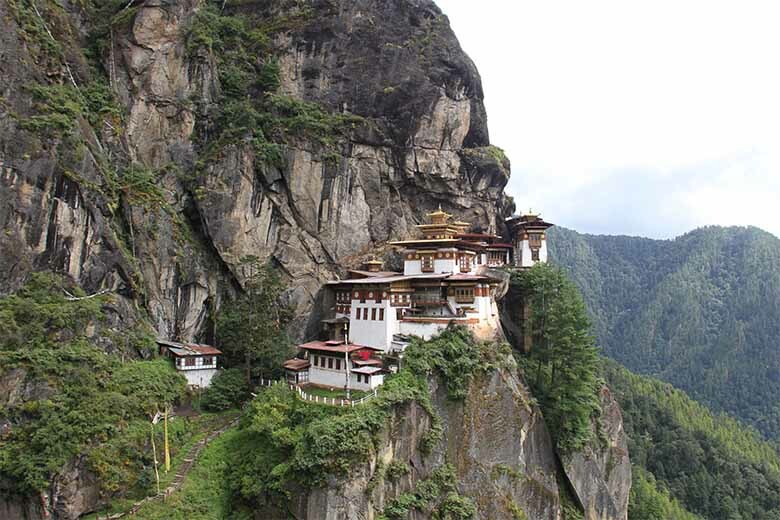 It is one of the 108 monasteries built by him to subdue evil spirits in the Himalayan region. Indian King Sendha Gyab also known as Sindhu Raja. 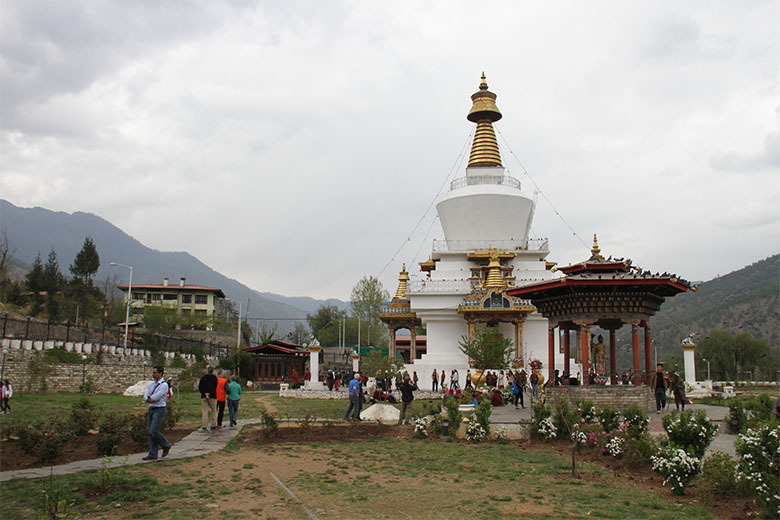 -Kurjey Lhakhang (Kurjey means, “Body imprint”): The temple to the right was built by Minjur Tempa in 1652. It was built around the cave in which Guru Rinpoche meditated and left his body imprint. -Tamshing Lhakhang: This temple is also known as Tamshing Lhendrup Chholing (Temple of the Good Message). -Jakar Dzong: The fortress is now used as an administrative center of the valley and summer residence of monks. village to visit Yathra weaving central. Yathra are made into colourful scarves, bags, blankets and sweater. Continue drive to Phobjikha a bowlshape valley on the western slopes of Black Mountain, visit Gantey Goenpa as it is a major attraction with an old monastery date back to the 16 century. 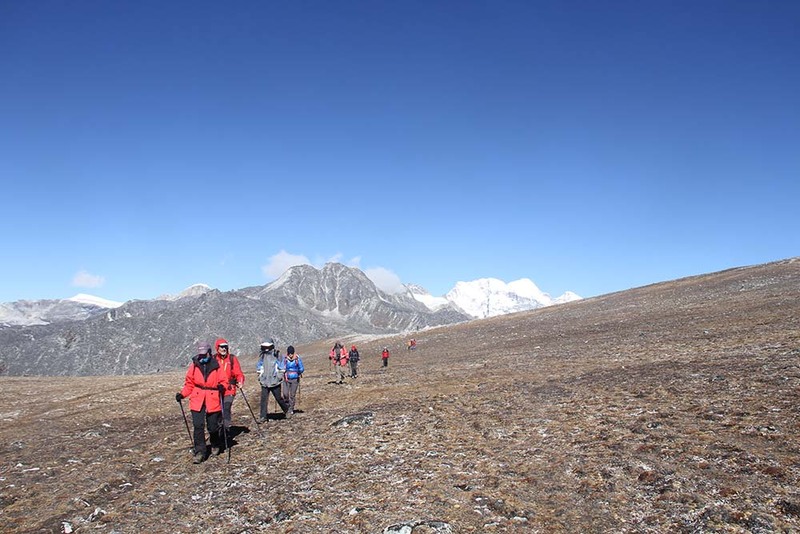 Later walk around the valley which is also the winter home to the rare black-necked cranes, which migrate, from remote parts of Tibet, China and Siberia during winter to this valley. Overnight will be at hotel. After breakfast drive to Punakha. 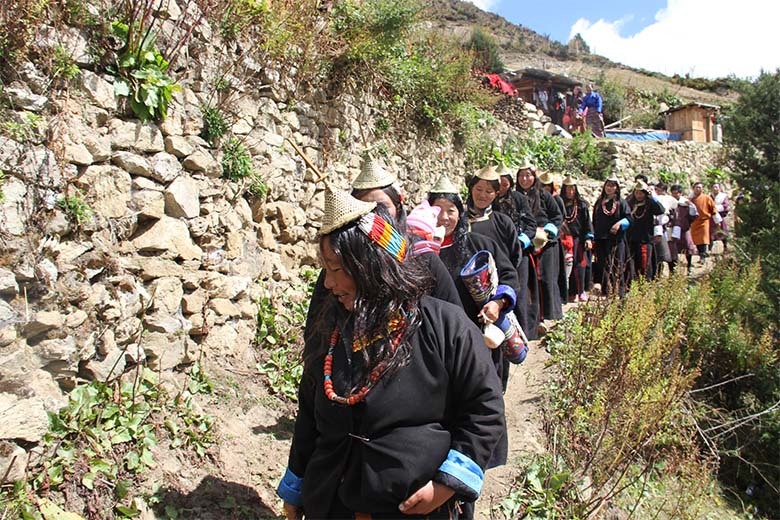 On the way visit Chhimi Lhakhang – this was founded in 15 Century by Lama Dukpa Kinley also known as divine mad man. It is half hour walk across a local village and rice field After lunch visit Punakha Dzong built in 1637 by Zhabdrung. It is one of the most beautiful Dzong in the country. Later walk around Punakha and Khuruthang town. Overnight at hotel. villages. From the Dochula pass, at over 10,000ft, vast panoramic views of the high snowcapped peaks of the Bhutanese Himalaya can be enjoyed on a clear day.Lunch will be served at Dochula cafeteria. And you even have an opportunity take a picture of Dochula, 108 stupas. Continue drive to Thimphu. Visit memorial chorten. Overnight at hotel. Memorial Chorten: Built in the year 1974 in the memory of our third king of Bhutan, His Majesty Jigme Dorji Wangchuck. 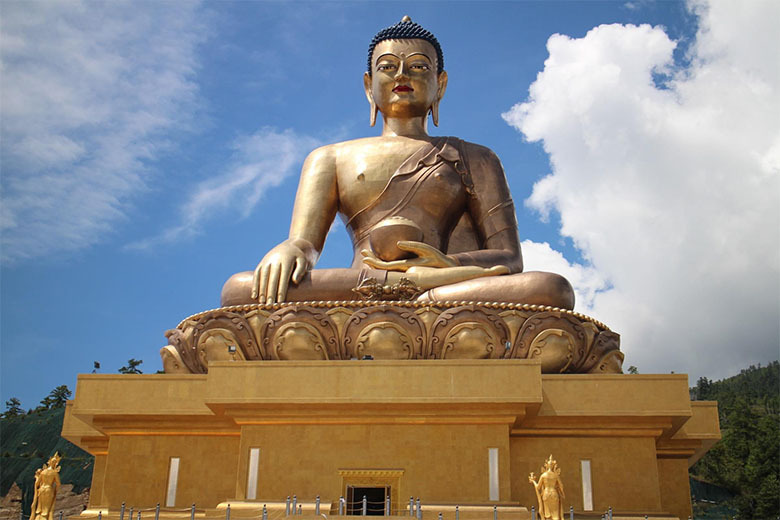 Buddha Point / Kuensel Phodang: Is the largest Buddha statue in the country, from there you can get a good view of the Thimphu valley. Motithang Takin Preserve: Houses the rare national animal of Bhutan. 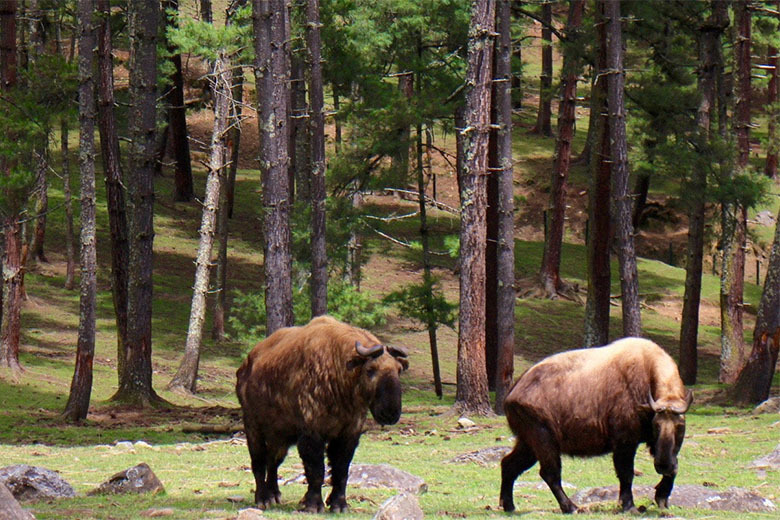 Takin is listed by international conservation agencies as a vulnerable species and it is a rare animal found only in Bhutan, Nepal and Burma. 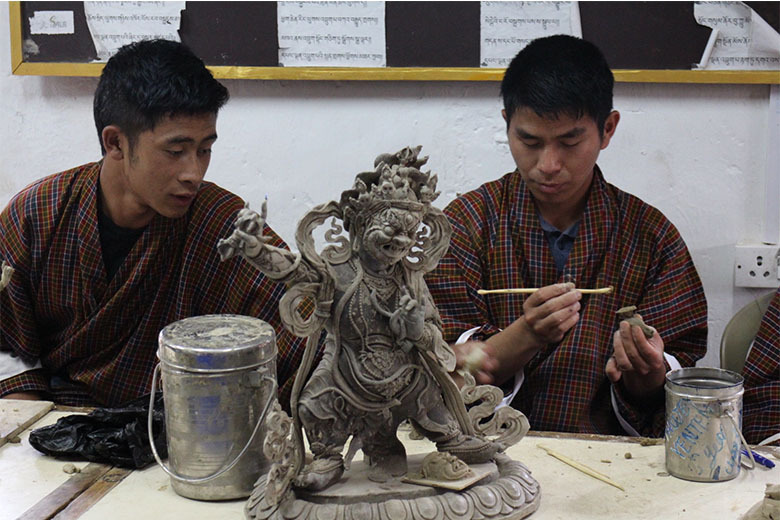 National Institute for Zorig Chusum: Or the school of Arts and crafts is an institute where student undertake a six year course on the 13 traditional arts and crafts of Bhutan. Traditional Medicine Institute: In Bhutan, equal emphasis is given to both allopathic and traditional medicines. 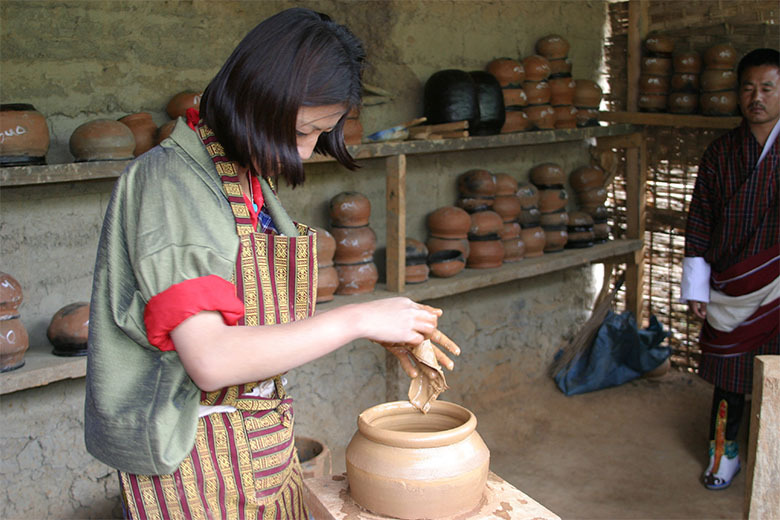 The rich herbal medicines made up from medicinal plants are prepared and dispensed here. Folk Heritage Museum: The house replicates a traditional farmhouse and is furnished as it would have been about a century ago. Overnight at hotel. After early breakfast drive to Paro and check in the hotel. Later drive up the Pa Chu to Drukgyel Dzong, the ruined Fort (destroyed by fire in 1950.) which once defended this valley from the Tibetan invasion. From here one can have the view of sacred Mt. Jhomolhari on clear days. Drive back to visit Ta Dzong former Watch Tower which now houses the National Museum and then visit Rinpung Dzong which houses the monastic school and the office of the civil administration walk down passing close by the Paro Dzong, crossing the Bhutanese typical wooden roofed bridge. Lunch will be served in the hotel. Later in the afternoon walk stroll around Paro town. Overnight at hotel. After breakfast, drive for half an hour and start the hike, which is about 5 hours (round trip.) The trail is along an ancient path marked by river powered prayer wheels. of the Victorious Drukpa,” which was also built by the Shabdrung to commemorate Bhutan’s victory over the Tibetans in the 16thcenturies. From here, the Jomolhari Peak (“Mountain of the Goddess”) can be seen on a clear day (Alt. 7,329m/24,029ft.). Overnight at hotel. 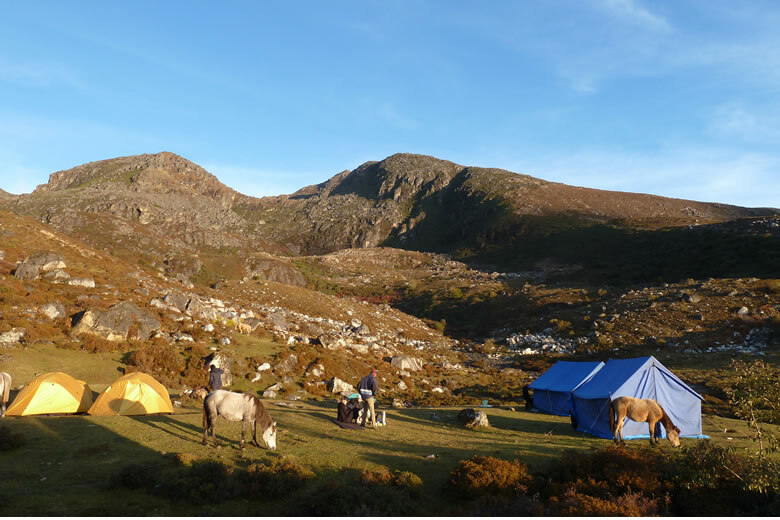 If you are looking for a trek that is fairly easy, with shorter daily hikes on rather good terrain, then consider the Druk Path. © 2016 Atlas Bhutan Tour & Travel. All rights reserved.